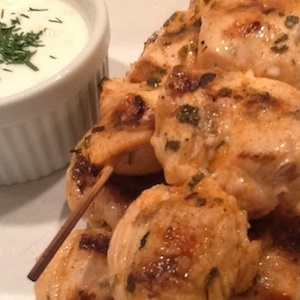 This Chicken Souvlaki recipe is a flavourful, fresh tasting and the perfect dish for a Greek meal and entertaining. Skewer chicken onto wooden skewers, about 3-4 pieces per skewer. Before preparing skewers soak wooden skewers in water for approximately 1 hour. This will prevent skewers from burning on the grill.